Smart Service is a mechanical contractor scheduling software solution that seamlessly pairs with QuickBooks. Since your existing customer information will integrate into our software, there’s no wait time for resuming your normal business practices. Scheduling, dispatching, routing, monitoring your crews, invoicing, and more can all be done with more efficiency and ease. The mobile app also means that any important information or job changes will update for your field technicians without any additional steps. This is how to do business smarter, not harder. Because Smart Service integrates with QuickBooks from the moment of installation, you can access your data right away and start scheduling. We know the frustrations of keeping track of paper work orders, deciphering handwriting, and trying to not to lose any information. That’s why Smart Service offers a mechanical contractor software solution that cleans up your process. 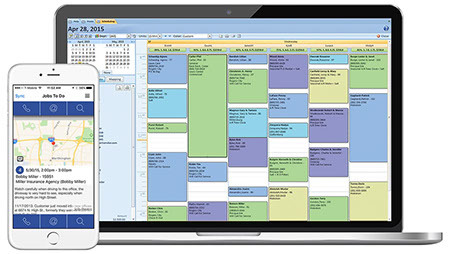 The easy-to-use scheduling interface is designed so you see the jobs you have scheduled for the week in one window. Simply click and highlight time gaps to schedule a new job. Start typing your customer’s name and Smart Service will input the rest. Then, you just assign the job to a free technician. Without any additional steps, that job will show up on your technician’s phone or tablet via our mobile app. They will have access to customer information, job history, job notes, and any forms they could need while out in the field. Smart Service mechanical contractor software puts any filing right at your fingertips. With this technology, searching and sifting through folders and cabinets becomes a thing of the past. Smart Service uses an interface that’s quick to get a handle on and easy to navigate so you can find any information you need with just a few clicks. Smart Service also adds your existing customer information, work history, installed equipment, and more to the job notes. Simply save the new job and the iFleet app will get the information to your team member’s mobile device right away. Our mobile app is the aspect of Smart Service that really brings the communication to a new level. Now your technicians in the field can get new jobs and job updates whenever something changes without trying to reach them on the phone. Techs can update the office too! Technicians can update their job progress, add line items, and collect any customer signatures. The app also allows for an extensive library of forms and paperwork that can be filled out while in the field. Once the job gets completed, Smart Service will use the work order information to generate an invoice right in QuickBooks, ensuring your billing remains accurate for all services rendered. Smart Service changes the way you deal with scheduling and streamlines the ability to change and add jobs. Check out our website to request a free demo of our mechanical contractor scheduling software! Check out some of our articles and how to bring out the best in your business!